Ski bindings are the devices that hold the ski boots onto the skis. They are designed so that if you get into trouble, your boot should detatch from the ski, before you can hurt your legs. They play a very important role as not only are they safety devices, they also transfer all the inputs you make into the skis, which is where all of your control comes from. The first thing to know about bindings is the DIN setting. DIN stands for Deutsches Institut für Normung (German Institute for Standardization) and is the industry standard scale for release force settings for ski bindings. This is the tension adjustment on the front and back parts of the bindings, and it determines how easily your boot will be released from the binding. The gauges on the top of the toe and heel housings are the visual indicators for this setting, which can be adjusted with the screws at the front and back of the binding. The DIN setting you should have is calculated by your weight, height, skier type, age and boot sole length, and should be set by a technician in the shop you get your skis from. A lot of shops will even test to make sure the bindings release under the correct forces. The correct DIN setting for you should be high enough that the skis do not come off when you don't want them to, but low enough that the skis will come off before you are in danger of injuring your legs. The tensions for the front and the back of the binding are set separately, and can be set to different values if required, although generally they are set to the same value. The DIN range available can change between different bindings, and it is important to use a binding with the right range for you. The DIN setting you have should not be towards the very top or bottom of the range available on your bindings, and should lie somewhere in the middle 75% of the range ideally as this is the area where the settings are the most accurate and reliable. The DIN Calculator can be used to find your recommended DIN setting, to give you an idea of what DIN range you should be looking for. A ski binding will release a ski boot in 2 different ways. The front of the binding lets the boot release sideways if there is a large twisting force. The tension for this release setting is displayed and set on the toe housing. The back of the binding will release the ski boot upwards if there is a large forward force on the boot. The tension for this release setting is displayed and set on the heel housing. On some bindings the heel cup can also move sideways as the boot is released, allowing the boot to leave the binding less obstructed when there is also a twisting or sideways force present. The parts and features ski bindings can have are explained below. The brakes are the two arms towards the back of the binding that stick into the snow when there is no boot in the binding. The brakes stop the skis from sliding away when they are left on the snow, and stop the skis from sliding too far if you crash and your skis release, although in some snow conditions this doesn't always work as effectively as it could. When you put your foot into the binding, the boot presses down on the brake pedal which lifts the brakes out of the snow, and tucks them in under the ski boot so that they are out of the way while skiing. The brakes stay in this position as long as the boot is in the binding, but as soon as the boot is released, the brakes spring back into their extended position. Brakes need to be matched to the ski they are mounted on, as different width skis need different width brakes in order for them to reach into the snow properly and fold away without being obstructed, or sticking out too much. 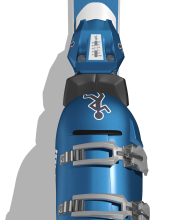 The anti friction device is the area or mechanism that sits under the front of the ski boot and minimises lateral friction between the ski boot and the binding. The purpose of AFDs is to ensure sideways forces from the ski boot are transmitted into the toe cup and not the base of the binding, and to let the ski boot slide sideways as easily as possible when the toe cup releases the boot. There are several different types of AFDs that can be found on ski bindings. Some bindings have a conveyor belt like system like the Mechanics of Sport bindings, whereas others have a spring loaded plate that will move sideways with the boot, and some just have a shiny metallic area that has low friction. Most bindings also have rollers inside the toe cup to further ensure that the boot will release easily. Riser plates are plates that go between the binding and the ski, so that the binding is mounted higher above the ski. Riser plates enable more pressure to be put on the edges and make ski boots drag in the snow less on leant over turns. They are often found on skis that are intended to perform well on hard or icy snow. 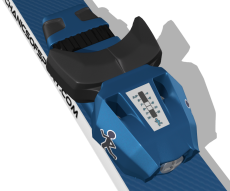 Some skis have systems built into their topsheets that require specific integrated bindings to be mounted on the skis. Some advantages this can bring are that how the bindings are mounted can be easily changed and adjusted, or bindings can even be swapped over. For most people buying skis, these advantages are not of any real importance. 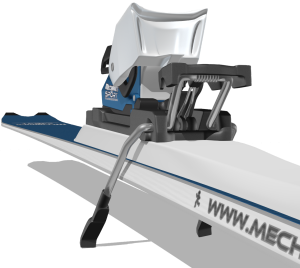 A standard non-specific binding that can be mounted on any flat surfaced ski is often as good as any, and can give you more choice. When a ski bends, the toe and heel housings of the binding get closer together, but the sole of the ski boot doesn't bend or change length. Because of this ski bindings are designed so that the heel housing is sprung, and will slide along the heel track as the ski bends. 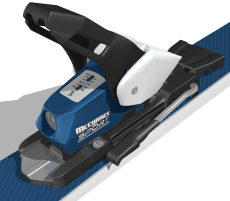 This enables the binding to adjust to the boot as the ski bends, and ensures an even forward pressure is always applied to the heel of the ski boot so that the boot is always held tightly and uniformly. Ski bindings are also built to dampen vibrations coming from the skis. Most bindings do this through the materials they are built of, but some use more elaborate damping systems often contained in the riser plate. The materials a binding is made of can effect how strong, durable, shock absorbing, power transmitting, and light your bindings are. Generally speaking, the better you are at skiing the more you will need your bindings made of stronger more expensive materials, as the forces the binding will need to deal with are larger. Bindings are designed to let the toe and heel of the boot move within them to an extent before they release the boot. This provides a certain amount of shock absorbtion, and stops the skis from being released inadvertently as often. 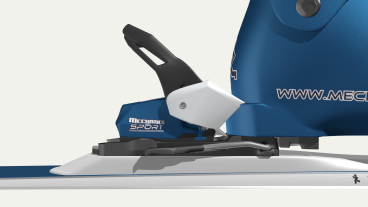 Most bindings are designed to let the boot move about 5mm, although this does vary between different manufacturers and models. On some bindings the height and width of the toe cup can be manually adjusted, although on most ski bindings this is done automatically. Ski boots are made so that the lips on the front and back of the boots are always the same dimensions so that they can fit into any binding. There is a difference between the size of lips on adult boots and junior boots, so you do still need to have adult boots for adult bindings and junior boots for junior bindings. The screws that hold adult bindings onto the skis are also longer than the screws that are used for junior binding, so adult bindings generally cannot be mounted on junior skis. Bindings and ski boots are designed so that ski boots will only fit in bindings in one direction, making it impossible to put the boot in backwards. To put the boot in the binding the lip on the front of the boot slides into the toe cup on the front of the binding, and then the back lip is lined up with the heel cup on the back of the binding and pushed down. The heel cup then rotates to clamp down on the back lip of the ski boot and the heel lever clicks upwards. To release the boot, take any weight off of the heel of the boot and push down on the heel lever. The heel cup will then rotate upwards and release the heel of the ski boot. Ski bindings are designed to be relatively free of maintenance, unless otherwise stated by the manufacturer. However, it is always good to keep the bindings free of dirt, salt or rust etc, and to store them in a warm dry place. Avoid cleaning the bindings with soap or solvents, as this can remove the factory lubricant which is needed to keep the binding functioning properly. Touring bindings are intended for both walking up the mountain and skiing back down. They have 2 different modes, one for walking up where the heel is not attached to the ski and the binding pivots from in front of the toe, and one for skiing down where the toe and heel are held as normal. There are several different systems that touring bindings can use, some systems work with normal ski boots and function mostly as described on this page, but other systems are quite different and require special boots. As touring bindings are intended for going uphill they are often made to be as light as possible, and because of this they are not always as strong or as durable as normal alpine bindings are. The information here is for alpine skiing bindings. Bindings for other types of skiing can be quite different. 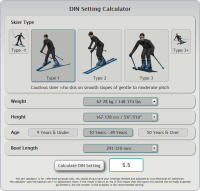 On to the Ski Boots section, or maybe you would like to use the DIN Setting Calculator.